If you’ve driven through the intersection of College and Mulberry lately, you may have noticed that the parking lot in front of the old Sports Authority building has been fenced in. The new owners are getting ready to do some work on the lot in order to prepare the site for a new grocery store that will be moving into the swoop-roofed building that was originally built to house a Safeway store. But before the parking lot, there used to be a house on that corner where the vast parking lot stretches today. 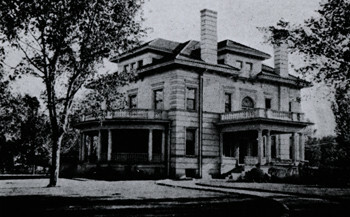 It was the C. R. Welch house and it was one of several grand houses that used to stand along S. College Avenue. This clipping was taken from the May 23, 1973 Coloradoan and is on file at the Fort Collins Archive. Corwin Welch was the son of local merchant Jacob Welch who built the Welch block on the NW corner of College and Mountain (where Austin’s is today). 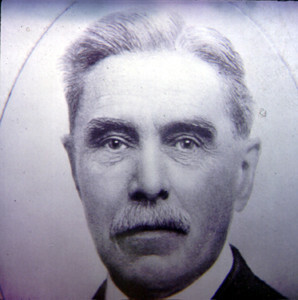 Corwin followed in his father’s footsteps as a merchant. He had a shop in Greeley for six years, then he moved to Boulder and ran a mercantile there for seven. 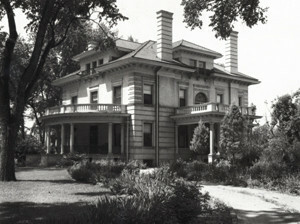 In 1883, he moved to Fort Collins where his parents already resided. He worked at First National Bank and eventually ascended to the role of President. 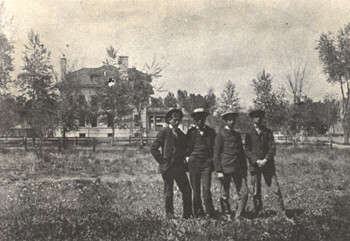 He was also instrumental in bringing the sugar factory to Fort Collins in 1903. 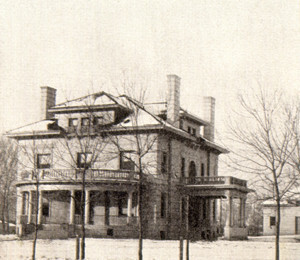 Corwin and Mary built the house at 425 S. College some time in the late 1800s. 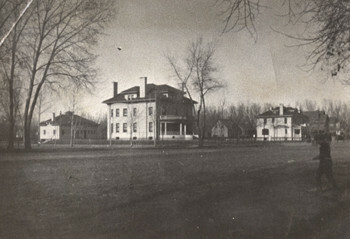 There are several pictures of the house in the local history archive. For anyone entering Fort Collins from the south, this grand establishment was one of the first landmarks the visitor would happen across back in the day. From the Archive at the Fort Collins Museum of Discovery – H00897B. 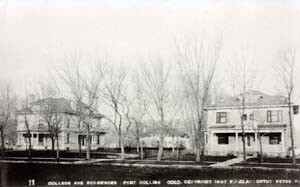 Note that College Avenue was only a dirt road at the time the photo above was taken, and though there are trees that have been planted along the street, there isn’t much else in the way of vegetation. From the Archive at the Fort Collins Museum of Discovery – H00906. Unfortunately the description in the Archive doesn’t include the identities of these four young men. From the Archive at the Fort Collins Museum of Discovery – H08433A. If you were to stand in the parking lot of the current Safeway on the NE corner of College and Mulberry and look to the west, then your view would be from the same perspective as this photo. It wouldn’t be quite so lovely, however, as the largest proportion of your view would be taken up with barren parking lot. From the Archive at the Fort Collins Museum of Discovery – H20821. From the Archive at the Fort Collins Museum of Discovery – H00882. 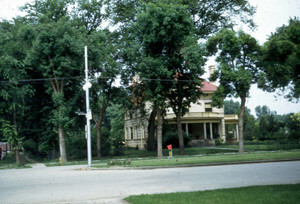 Next to the Welch house (at left) was the Fred Stover house, located at 413 S. College. From the Archive at the Fort Collins Museum of Discovery – H00907. From the Archive at the Fort Collins Museum of Discovery – H04550. I love the two photos above because the house remains resolutely the same while the landscaping has changed over time. From the Archive at the Fort Collins Museum of Discovery – H084331. 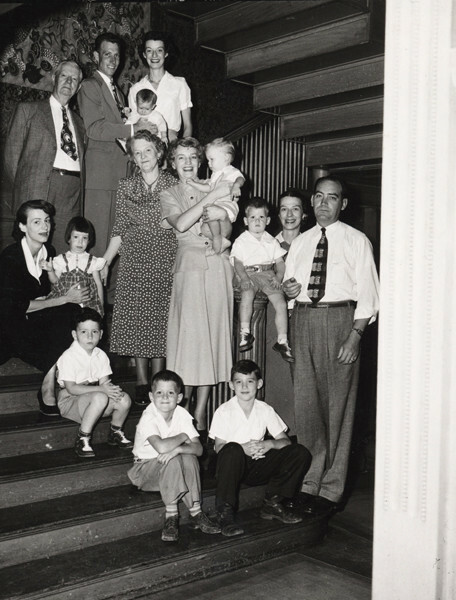 Mr. Welch moved to Los Angeles in his old age to live with his sister Martha and niece, Louise. He died in 1907 and is buried in Hollywood. Charles and June Evans bought the house. 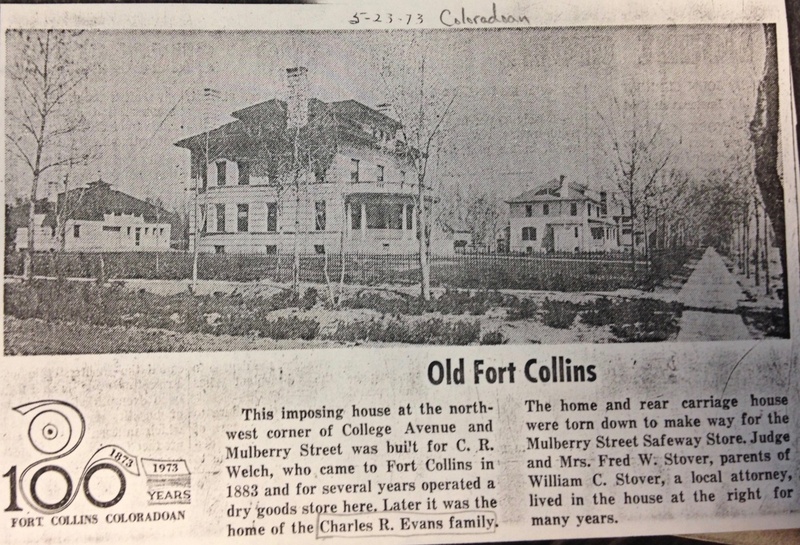 Charles R. Evans also worked at the First National Bank of Fort Collins. From the Archive at the Fort Collins Museum of Discovery – S00520. 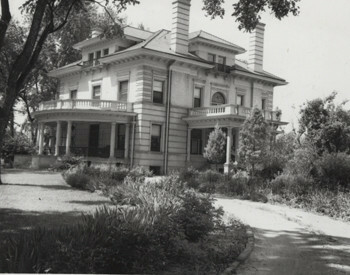 The house was hidden behind trees in this early 1950s photo. The Evans family also owned farm land off of Prospect Road. 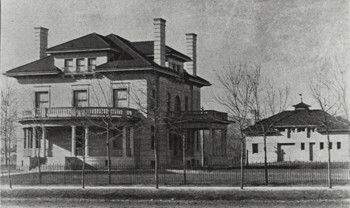 When the Welch/Evans house was demolished, the family saved substantial sections of the house and installed them into a more modern looking building at the NW intersection of Remington and College. You may have read about this house at 1535 Remington St. in the Coloradoan recently. The City Council recently determined that imminent domain could be used in order to take a section of this property in order to widen Prospect between Remington and College. The Safeway building most recently held a Sports Authority store. The Colorado Real Estate Developer, McWhinney, currently owns this site. According to City docs, they will be updating the landscaping, parking lot, and lighting on the site, but will not be altering the building in any significant way. Soon a new grocery store will be located in this unique Fort Collins landmark. I remember when there were two Safeways, and every three or four or five years, one of them would remodel and become the new Safeway. Turner Classic Movies recently showed SAMMY, THE WAY OUT SEAL as part of their Disney Treasures series, which brought to mind a trip to the Safeway parking lot by the old Fox Theater to see a seal in a large tank, not unlike a watering tank for cattle. Of course, ‘Sammy’ the Stand-In Seal was associated with the theater, but it felt like he was more in front of the grocery store than the Fox. I was young enough that my vague impression was that the distant speck of seal was Smacksy, the Sugar Smacks Seal (who was a cartoon character; not that this made much of a difference to me at that point). *”Money, money. I like money. My wife’s saving money at Safeway…!” Come to think of it, there was a TV version. I’m pretty sure I remember seeing The Missus ironing bills, because she liked money too. Wow! Marketing was a whole different animal back then, wasn’t it? I don’t know where the Fox theater was. Was it near the Safeway at Prospect and College? Great memories. Thanks for sharing! 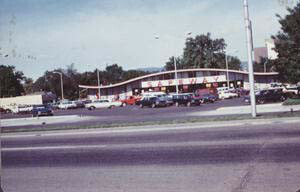 The Fox stood at the south end of the Prospector Shopping Center (is that still there?) which was parallel to the train tracks and the creek—Spring Creek, I guess—that ran behind it. The Fox would be the disproportionately large building, and it faced College Avenue. My friend Scott’s old man was a janitor at the building, and Scott did a fair amount of cleaning up there as well, and had free passes to movies. I remember going with him one time and seeing that the major part of the process was blowing all the loose stuff to the front of the auditorium where it could be swept up. There was a Lost & Found box behind the screen which, on examination, contained nothing of much interest. I swiped a heavy plastic “Back Seat Driver’s License” from a wallet (presumably, anything worth having in the wallet was long gone), with such screamingly humorous details as signatures by such names as “G.M.I. Nervous” validating it.